Hell Hawks! is the story of the band of young American fighter pilots, and their gritty, close-quarters fight against Hitler's vaunted military. The Hell Hawks were the men and machines of the 365th Fighter Group. Beginning just prior to D-Day, June 6, 1944, the group's young pilots (most were barely 20 years old and fresh from flight training in the United States) flew in close support of Eisenhower's ground forces as they advanced across France and into Germany. They flew the rugged, heavily armed P-47 Thunderbolt, aka the "Jug". Living in tents amid the cold mud of their front-line airfields, the 365ths daily routine had much in common with that of the G.I.s they supported. Their war only stopped with the Nazi surrender on May 8, 1945. During their year in combat, the Hell Hawks paid a heavy price to win the victory. Sixty-nine pilots and airmen died in the fight across the continent. The Group's 1,241 combat missions -- the daily confrontation of sudden, violent death -- forged bonds between these men that remain strong sixty years later. 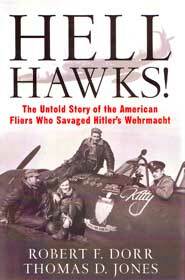 This book will tell their story, the story of the Hell Hawks. 336 pages, 9 x 6, softbound.